While dogs are not humans, they do have the same impact on trails as skiers and, in some cases, a slightly greater impact. 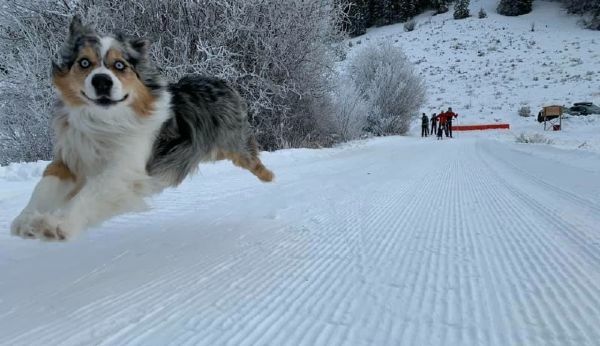 In order to keep our four-legged facilities top-notch for both dogs and skiers, Methow Trails has a dog pass program. Dog owners must purchase a $50 annual pass at the Methow Trails office or a $10 day pass from any ski pass vendor and agree to the “Conditions of Use”. All dogs must wear their pass at all times while on the ski trails. Now they can proudly display their allegiance to the trails, just like their humans. Funds from the dog pass program help Methow Trails maintain and enhance the skiing infrastructure. Below are the conditions of use for pet owners and trail users while enjoying dog trails. Thanks for your support. Dog Pass must be displayed at all times either on the dog or visible on the owner. Aggressive dogs are not permitted on the trails. Dog owners are responsible for picking up poop on the trail. No more than 2 dogs per skier. Dog owners must have their dogs in visual contact and under voice control at all times. Leashes must be used if your dog chases wildlife. As the dog owner you are responsible and liable for your dog's behavior and actions. Failure to abide by the conditions of use may result in the loss of trail passes. If your dog wanders or is excited, please keep your dog in your vehicle or on leash while getting your gear ready or when near a trailhead.